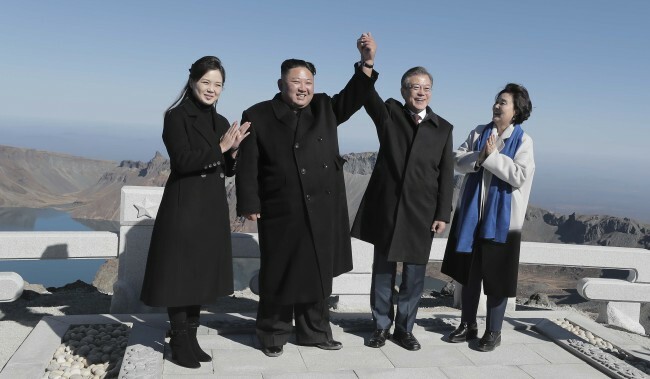 As the leaders of the two Koreas stood together atop Paektusan for the first time, South Korean President Moon Jae-in on Thursday expressed hopes for expanded tourism to the Korean Peninsula’s highest mountain. As of now, the mountain is only accessible to South Koreans from the Chinese side -- leaving parts of it inaccessible to them. “Now that we’ve taken the first step, if we repeat these steps and more people come (to Paektusan), I believe there will be a time when citizens of South Korea can visit Paektusan,” Moon told North Korean leader Kim Jong-un. Moon and first lady Kim Jung-sook’s visit was the last stop on their itinerary in North Korea. After leaving the Paekhwawon State Guesthouse in Pyongyang, Moon and Kim Jung-sook boarded a presidential plane at Sunan International Airport. Upon their arrival at Samjiyeon Airport near Paektusan, they were greeted by Kim and his wife, Ri Sol-ju. The two first couples rode to Paektusan’s highest peak Janggunbong, where they walked down to a spot with a clear view of Chonji, a crater lake. “I told the chairman (Kim) during our April 27 summit that there was a time when so many (South Korean) people visited Paektusan from the Chinese side. I told myself that I’d never go from the Chinese side, that I will go from our (Korean) side. ... My wish has come true,” Moon said, as they strolled along the shore of Chonji. “Chinese people envy us because they cannot go down to Chonji from their side, but we can,” said Kim, showing the South Korean first couple where China ends and North Korea begins. First lady Kim said she brought a bottle of water from Hallasan -- the South’s highest peak -- half of which she poured into the crater lake, filling that space with water from Chonji. Kim pledged to write a “new history” of the two Koreas with Moon while touring around the mountain that has a special meaning for Koreans, both South and North, as the birthplace of Dangun, the founder of the first Korean kingdom, according to the founding myth of Korea. Wrapping up the Paektusan tour and his three-day visit, Moon promised Kim that he would be guided to South Korea’s highest peak, Hallasan. In the aforementioned summit, Kim pledged to visit Seoul within the year, which would mark the first time ever for a North Korean leader. “There is an old saying in our country, ‘To greet the sun at Paektusan and welcome unification at Hallasan,” said Ri.